To bear testimony to God and shame the great red dragon you must have a principle, and a condition: In your heart you must love God, and enter into the words of God. If you do not enter into the words of God, then you will have no way of shaming Satan. Through the growth of your life, you renounce the great red dragon and bring utter humiliation upon it, and only then is the great red dragon truly shamed. The more you are willing to put the words of God into practice, the greater the proof of your love of God and loathing of the great red dragon; the more you obey the words of God, the greater the proof of your longing for the truth. People who do not long for the words of God are people who are without life. Such people are those who are outside the words of God, and who belong to religion. People who truly believe in God have a more profound knowledge of God’s words through eating and drinking the words of God. If you do not long for the words of God, then you cannot truly eat and drink the words of God, and if you have no knowledge of the words of God, then you have no means of testifying to God or satisfying God. In your belief in God, how should you know God? You should come to know God based on the words and work of God today, without deviation or fallacy, and before all else you should know the work of God. This is the foundation of knowing God. All those various fallacies that lack a pure acceptance of the words of God are religious conceptions, they are an acceptance that is deviant and erroneous. The greatest skill of religious figures is taking the words of God that were accepted in the past and checking the words of God today against them. If, when serving the God of today, you cling to the things enlightened by the Holy Spirit in the past, then your service will cause an interruption, and your practice will be outdated and nothing more than religious ceremony. If you believe that those who serve God must be outwardly humble and patient…, and if you put this kind of knowledge into practice today, then such knowledge is religious conception, and such practice has become a hypocritical performance. “Religious conceptions” refers to things that are outmoded and obsolete (including the acceptance of words previously spoken by God and light directly revealed by the Holy Spirit), and if they are put into practice today, then they are the interruption of God’s work, and of no benefit to man. If man is unable to purge those things within him that belong to religious conceptions, then they will become a great hindrance to man’s service to God. People with religious conceptions have no way of keeping up with the steps of the Holy Spirit’s work, they fall one step behind, then two—for these religious conceptions cause man to become extraordinarily self-right and arrogant. God feels no nostalgia for what He spoke and did in the past; if it is obsolete, then He eliminates it. Surely you are able to let go of your conceptions? If you cling to the words that God spoke in the past, does this prove that you know the work of God? If you are unable to accept the light of the Holy Spirit today, and instead cling to the light of the past, can this prove that you follow the footsteps of God? Are you still unable to let go of religious conceptions? If that is the case, then you will become someone who opposes God. If man can let go of religious conceptions, then he will not use his mind to measure the words and work of God today, and instead will obey directly. Even though God’s work today is manifestly unlike that of the past, you are able to let go of the views of the past and directly obey the work of God today. If you are capable of such knowledge that you give pride of place to the work of God today no matter how He worked in the past, then you are someone who has let go of their conceptions, who obeys God, and who is able to obey the work and words of God and follow the footsteps of God. In this, you will be someone who truly obeys God. You do not analyze or scrutinize the work of God; it is as if God has forgotten His previous work, and you, too, have forgotten it. The present is the present, and the past is the past, and since today God has put aside that which He did in the past, you should not dwell on it. Only then will you be someone who completely obeys God and has completely let go of their religious conceptions. Because there are always new developments in God’s work, thus there is new work, and thus there is also work that is obsolete and old. This old and new work is not contradictory, but complementary; each step follows on from the last. Because there is new work, the old things must, of course, be eliminated. For example, some of the long-established practices and habitual sayings of man have, coupled with man’s many years of experience and teachings, formed all manner of conceptions in the mind of man. Yet more propitious to the formation of such conceptions by man is that God has yet to fully reveal His true face and inherent disposition to man, combined with the spread, over many years, of traditional theories from ancient times. It is fair to say that, during the course of man’s belief in God, the influence of various conceptions has led to the continual formation and evolution of a knowledge in man in which he has all kinds of conceptions about God—with the result that many religious people who serve God have become His enemies. And so, the stronger people’s religious conceptions, the more they oppose God, and the more they are the enemies of God. The work of God is always new and never old, and it never forms doctrine and is, instead, continually changing and renewing to a greater or lesser extent. This work is the expression of the inherent disposition of God Himself. It is also the inherent principle of God’s work, and one of the means by which God accomplishes His management. If God did not work in this way, man would not change or be able to know God, and Satan would not be defeated. Thus, in His work there continually occur changes that appear erratic, but which are actually periodic. The way in which man believes in God, however, is quite different. He clings to old, familiar doctrines and systems, and the older they are the more palatable they are to him. How could the foolish mind of man, a mind that is as intransigent as stone, accept so much unfathomable new work and words of God? Man abhors the God who is always new and never old; he only likes the antiquated old God who is white-haired and immobile. Thus, because God and man each have their own likes, man has become the enemy of God. Many of these contradictions still exist even today, at a time when God has been doing new work for almost six thousand years. They are, then, beyond remedy. Maybe it is because of the stubbornness of man, or the inviolability of God’s administrative decrees by any man—but those clergymen and women still cling to moldy old books and papers, while God carries on with His uncompleted work of management as if He had no one by His side. Though these contradictions make enemies of God and man, and are even irreconcilable, God pays them no heed, as if they were there and yet not there. Man, however, still sticks by his beliefs, and never lets go of them. Yet one thing is self-evident: Even though man does not deviate from his stance, God’s feet are always moving and He is always changing His stance according to the environment, and in the end, it is man who will be defeated without a fight. God, meanwhile, is the greatest enemy of all of His foes who have been defeated, and is also the champion of those among mankind who have been defeated and those who have yet to be defeated. Who can compete with God and be victorious? Man’s conceptions seem to come from God because many of them were born in the wake of God’s work. Yet God does not forgive man because of this, nor, moreover, does He pour praise on man for producing batch after batch of products “for God” that are outside the work of God. Instead, He is extremely disgusted by man’s conceptions and old, pious beliefs, and even ignores the date on which these conceptions first emerged. He does not accept at all that these conceptions are caused by His work, for the conceptions of man are spread by man; their source is the thoughts and mind of man, and is not God, but Satan. God’s intention has always been for His work to be new and alive, not old and dead, and that which He makes man hold firm to varies with the age and period, and is not everlasting and immutable. That is because He is a God who causes man to live and be new, rather than a devil who causes man to die and be old. Do you still not understand this? You have conceptions about God and are incapable of letting go of them because you are closed-minded. It is not because there is too little sense to God’s work, or because the work of God is not in line with human wishes—nor, moreover, is it because God is always negligent in His duties. That you cannot let go of your conceptions is because you are too lacking in obedience, and because you have not the slightest likeness of a creature of God, and not because God is making things difficult for you. All of this has been caused by you, and bears no relation to God; all suffering and misfortune is caused by man. God’s intentions are always good: He does not wish to cause you to produce conceptions, but wishes for you to change and be renewed as the ages pass. Yet you can’t tell chalk from cheese, and are always either scrutinizing or analyzing. It is not that God is making things difficult for you, but that you have no reverence for God, and your disobedience is too great. A tiny creature dares to take some trivial part of that which was previously given by God, and turns it around in order to attack God—is this not the disobedience of man? Man, it is fair to say, is utterly unqualified to express his views before God, much less is he qualified to come up with whatever worthless, stinking, rotten maxims he feels like—to say nothing of those moldy conceptions. Are they not even more worthless? Someone who truly serves God is someone who is after God’s heart and fit for use by God, and who is able to let go of their religious conceptions. If you wish eating and drinking the words of God to be fruitful, then you must let go of your religious conceptions. If you wish to serve God, then it is even more necessary to first let go of religious conceptions and obey the words of God in all that you do. This is what should be possessed by someone who serves God. If you lack this knowledge, as soon as you serve, you will cause interruptions and disturbances, and if you keep holding on to your conceptions, then you will inevitably be knocked down by God, never to get up again. Take the present, for example. 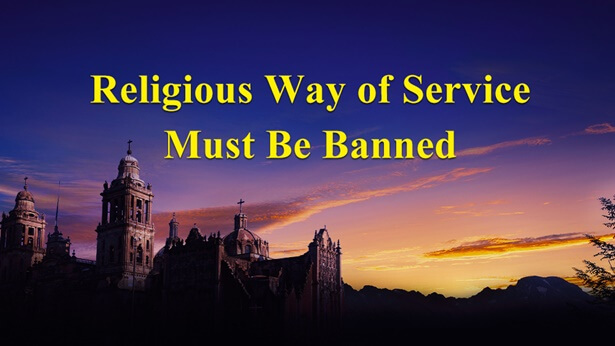 A lot of the utterances and work of today are incompatible with the Bible, and incompatible with the work previously done by God, and if you have no desire to obey, then you may fall at any time. If you wish to serve in accordance with the will of God, then you must first let go of religious conceptions and rectify your own views. Much of what is said in the future will be incompatible with what was said in the past, and if now you lack the will to obey, you will be unable to walk the path that lies ahead. If one of God’s methods of working has taken root inside you and you never let it go, then this method will become your religious conception. If what God is has taken root within you, then you have gained the truth, and if the words and truth of God are capable of becoming your life, you will no longer have conceptions about God. Those who possess a true knowledge of God will have no conceptions, and will not abide by doctrine. 1. Does the knowledge within you interfere with your service to God? 2. How many religious practices are there in your daily life? If you only give the appearance of piety, does this mean that your life has grown up and matured? 3. When you eat and drink the words of God, are you able to let go of your religious conceptions? 4. When you pray, are you able to do away with religious ceremony? 5. Are you someone who is fit for use by God? 6. How much of your knowledge of God contains religious conceptions?